I should probably be more of a jazz fan than I am. I was born into a jazz family—my Dad a jazz pianist and my Mom a jazz singer. For a while they even had their own combo, my Mom playing the vibes in addition to singing. I don't remember much of that (I was pretty young), but I do remember my Dad practicing on the old upright they got from my Mom's mother (I still have that incredible piano). 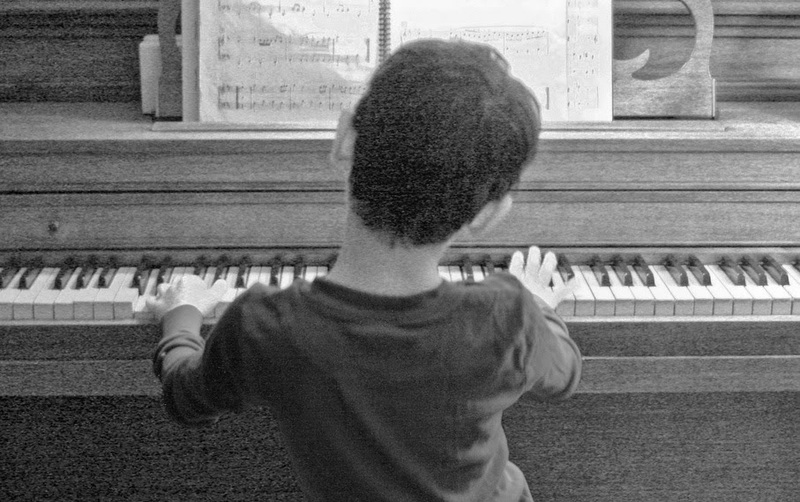 I demonstrated a very precocious musical ear at age six, when I asked my Dad if I could please play the piano. He said I could but there were two rules: I couldn't bang on it, and I couldn't play any of those horrible things that everyone else who couldn't play the piano always played: “Chopsticks”, “Heart and Soul”, or “Knuckles.” I agreed—and with two fingers picked out the melody to a Latin piece he was practicing at the time. I even came up with an intro to it, which he ended up incorporating into his arrangement. But mostly the jazz that my Dad played didn't reach me at all. It sounded like a bunch of way complicated chords that I couldn't decipher and didn't really want to. Years later I listened to his main influences—George Shearing primary among them—and understood him a lot better. But what kind of jazz can get through to a kid? Well, in my case it began with an album my mom had recently purchased: Mack the Knife: Ella in Berlin. At that tender age, I fell totally in love with Ella Fitzgerald. I couldn't get enough of that record. Ella's sense of pitch and her unbelievable level of communication came through to my very core. Over 50 years later, that's still one of my all-time favorite albums, and Ella is my all-time favorite female vocalist (Aretha Franklin runs a very close second). Years passed in there where I didn't encounter jazz much, with a few exceptions. My Mom had some jazz 45s that I played repeatedly: Vince Guaraldi's Cast Your Fate to the Wind, Ramsey Lewis doing "The In Crowd," and a Cal Tjader recording of "Cool" from West Side Story on red vinyl (that thing's got to be worth some bucks today—too bad I don't still have it!). My Mom also purchased an album called Comin' Home Baby! by Mel Torme. Interestingly, Mel had been hesitant to record the title track, as it was more of a rock-and-roll song than a jazz song—but he sure didn't complain when it was such an enormous hit. The rock-and-roll side of me loved the song, but I ended up listening to the rest of the album which, Mel being Mel, was really a jazz album. His voice, his sense of pitch (like Ella's) and his perfect timing really grabbed me, even if I didn't know what was grabbing me. I played the album many times when my Mom wasn’t home, and that’s yet another album I still own today. Other than those exceptions, my tastes ran pretty much along the lines of any other kid’s: to rock and roll. I was an enormous Beatles fan. I died for the soul music coming out of Detroit (Motown) and Memphis (Stax). I really dug the psychedelic music coming out of England and San Francisco—and thankfully was too young to engage in the excesses which came with it. Jazz would always find a way of sneaking back into my range of hearing, though. At age 12, that happened in a seriously major, but very intimate way. The public television station PBS didn’t have commercials, so they used to do this thing in between shows where they'd have like 10 minutes of some musical artist performing, just the artist and the camera. Once when I was home alone (that happened a lot as I was growing up) they aired one of those, featuring Miles Davis—totally unaccompanied, just him and the horn. He played for probably eight minutes or so, and for me, time... just... stopped. If you can imagine one of those exquisite solos Miles played in the Kind of Blue days, it was like that—only there was no band. I leaned as closely as I could into that little black-and-white TV screen, totally hypnotized. Every single casually blown, yet perfect note, seemed to take me far off into some other land—where there were no cares, no school, no alcoholic parents, only agonizingly beautiful music—and then bring me back again just in time for the next one to do the same thing. I think that when it was over, I sat staring at the TV set for some minutes, not even seeing what was there. Like any other form of music, jazz works for me when it communicates extremely well. That performance certainly did. And whenever I listen to a Miles album, I remember that one moment that was just me and him—personal.